Your browser seems to be out of date. Please upgrade your browser to view this site as it was intended. Given the wide public interest in the history of the San Francisco Bay Area, Archeo-Tec exhibits collections of artifacts whenever possible. Archeo-Tec has curated several exhibits at such venues as the Asian Art Museum, the Pacific Heritage Museum, and the Oakland Art Museum. In addition to museum exhibits, artifacts are often showcased in the lobbies of buildings erected atop sites. Archeo-Tec is currently seeking facilities and funding for several future Gold Rush Exhibitions, and welcomes inquiries from museums and interested parties. An extensive Oakland Art Museum exhibit coinciding with the 1998 sesquicentennial of the Gold Rush, showcased artifacts from several different San Francisco Gold Rush sites: Chinese Fishing Village, 600 California, The International Hotel, 100 First Street, Hills Plaza, Levi's Plaza, and the Hoff Store. Artifacts included soda water bottles, medicine vials, ceramic cups, a jar full of olives, a bone toothbrush, iron shovels, Chinese brownware, and various toys. In 1999, GOLD FEVER traveled to the historic Sacramento Memorial Auditorium in Old Sacramento. "Urban Archaeology: A Gold Rush Site in San Francisco's Chinatown" In December of 1989, Archeo-Tec organized an exhibit at the Asian Art Museum showcasing materials from the prolific 1851 Mercantile site at 600 California Street. This exhibit included bronze coins, glass beads, Chinese ceramics and Chinese brownware. However, this exhibit was never launched as a result of the damage done to the Museum during the San Francisco Earthquake of 1989. "The Opening Door: American Commercial and Cultural Exchange with China and Japan, 1840-1890." In 1988, Archeo-Tec curated this exhibit, bringing in such artifacts as an ivory chess set from the Lowie Museum of Anthropology and a fan from the Peabody museum of Salem commemorating President Grant's 1879 visit to Japan. Other contributors include the Natural History Museum at the Smithsonian Institution, the Rare Oriental Book Company, and the U.S. 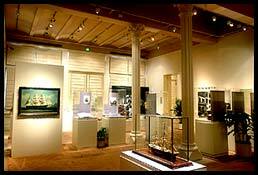 Naval Acadamy Museum. Several artifacts from Archeo-Tec's own collection were also displayed. "Life in Golden Mountain: A History of Chinese Immigrants 1848-1882" This 1984 exhibit at the Pacific Heritage Museum traced the history of Chinese immigration from the 1848 Gold Rush Boom to 1882, when the Chinese Exclusion Act severely restricted immigration. Several museums contributed to the exhibition; Archeo-Tec exhibited food storage vessels, tableware, glass bottles, photographs, and a narrative history display of Chinese settlement in San Francisco. At 505 Montgomery Street, the Banking house of James King of William contains a permanent lobby display (from 1990) entitled "Foundations of Commerce," showcasing the transition of Montgomery Street between the years of 1849 and the 1870's. Initially, the street boasted banks, hotels, and offices, yielding such artifacts as glass trade beads and clay pipes. By 1870, Chinese immigrants ran most businesses along Montgomery Street: laundries, restaurants, a cigar factory and a slipper manufacturer. Artifacts showcased from this period include a Chinese ceramic ginger jar, intact soy pots with lids, and Chinese medicine vials. Unveiled in 1988, a permanent exhibit at the Rincon Annex Post Office displays cultural materials unearthed in Archeo-Tec's 1986 excavation preceding the building's construction. The assemblage of artifacts on display includes a child's tea set, a harmonica, various bullets, and Chinese ceramics. In 1987, Archeo-Tec launched a permanent display at the Bayside Village Leasing Office of a large collection of Chinese artifacts. The exhibit traces a material history of the Rincon Point/South Beach area of San Francisco from its initial 1850 settlement by Chinese fishermen to the 1860's, when the village had become an established commercial and residential neighborhood. Artifacts on display include Chinese Soy jugs, ceramic rice bowls, glass medicine vials, dolls, and French perfume. In September of 1988, an exhibit at the San Francisco Public Library showcased a range of Archeo-Tec's findings from a variety of San Francisco sites. Dating from the mid 19th Century Gold Rush to the 1906 earthquake, artifacts included children's toys, Euro-American house wares, Chinese house wares, and glass bottles. All photos and text copyright © 2002-2012 Archeo-Tec, Inc., unless otherwise noted.